Olentangy High School student Hailey Piché’s ceramic work entitled “Stigma” was named Best of Show in the Delaware County High School Art Show currently on display at The Delaware Arts Castle. Pictured, left to right, are M. Caroline Jones from Fidelity Federal Savings & Loan, Piché, and Arts Castle board member Walt Abood. Pictured are local high school students who placed in this year’s juried Delaware County High School Arts Show. The students’ art work is on display through Feb. 24 at The Delaware Arts Castle, 190 W. Winter St., Delaware. Nearly 200 talented young artists from Delaware County have original art work currently on display at the Delaware Arts Castle in the annual Delaware County High School Art Show. A juried exhibit that is sponsored by Fidelity Federal Savings & Loan, the winners have been selected and were honored at a reception held Jan. 27 at the Arts Castle in Delaware. The exhibit consists of approximately 200 entries from students at nine high schools located throughout the county: Delaware Hayes High School, Olentangy High School, Olentangy Liberty High School, Olentangy Orange High School, Olentangy Berlin High School, Buckeye Valley High School, Ventures Academy, Delaware Christian and Powell Village Academy. One of two jurors, Rosellina Avoscan, is a painter, sculptor and ceramist. Born in Italy, she received her B.A. Honors degree in fine art from Chelsea College of Art and Design in London and taught art at London’s Uxbridge College and Youth Centre until 2004. Since 2008, Avoscan has resided in both Cortona, Italy, and Delaware, Ohio, where she currently has her studio. 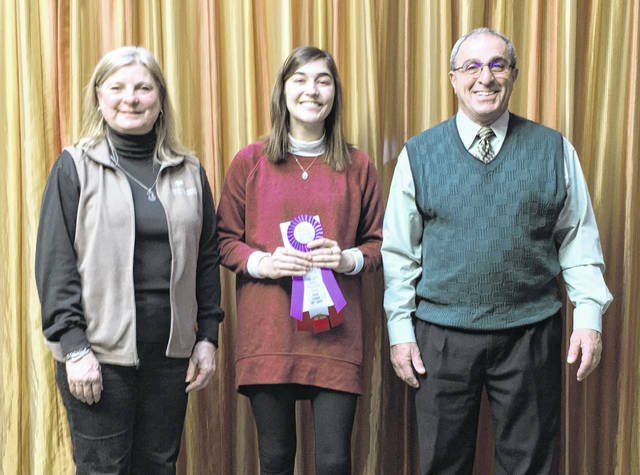 Her work has been exhibited internationally with shows in Great Britain, Italy, and the U.S.
Also judging this year’s show was Laura Carey, an art teacher at River Valley Local Schools in Caledonia. Carey received her BFA from Baldwin Wallace College and a master’s degree in education from Mary Grove College, as well as in special education at the University of Cincinnati. She has been teaching for 22 years. Alison Alsup, Karl, Delaware Hayes, painting. The Delaware County High School Art Show is open free of charge to the public through Feb. 24 at The Arts Castle, 190 W. Winter St., Delaware. For more information call 740-369-ARTS (2787).